This is an Amsler Grid. It is used by eye doctors to help determine whether there is damage to the macula of the eye. 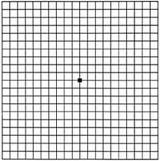 Cover one eye and look at the dot in the center of the grid. Notice whether any of the lines look wavy or distorted. Notice whether any parts of the grid seem to be missing. If you notice any distortion or parts that are missing, it is a good idea to contact your eye doctor for an exam. Many problems with the macula can be repaired more easily if they are detected early. If you are having a problem, don’t wait. One reason that I can see so well today is that I went to my eye doctor right away when I noticed blurring. Hi Belinda-I was checking out some loss of vision blogs and came across your blog when I went the the Vision Aware website and read your personal story. I am a Catholic and also have a significant vision loss. I am a social worker, actually looking for work now and want to do more to help empower those of us with vision loss. I love your photography. I would like to hear more about how you use your digital camera. I have one too and sometimes my pictures turn out OK and lots of times they do not. Take care. Your blog inspired me to try to set up a blog too. I would love to hear from you. Thanks for the eye test. I belong to the Lions Club and our number one goal is to help people with sight impairments. I will continue to to visit your blog just to get a better appreciation for what you have to do to compensate in your life. It may make me a better Lion. I am familiar with the Lions Club. Thank you so much for all you do to help people who have visual impairments. I thank you for checking out so many of my pages and commenting. It means a lot to me. Hi, Belinda. I was checking out some Catholic blogs and stumbled across yours. I read the name and was intrigued. I am Catholic and am also blind. I use screen readers to surf the Web and do all of my computer-related tasks. I teach assistive tech to blind adults. It sounds like you are well-connected with good online communities of blind folks, but if you ever want to chat or need info please don’t hesitate to email me. I’m not a product salesman, just an a.t. trainer and a passionate technology enthusiast and a passionate Catholic. God love you. Hi. How nice to meet you. Thank you so much for stopping by my blog and for taking the time to post such a nice comment. It’s good to know you are there and that I can turn to you with my questions. Glad you found me among the Catholic blogs. © Belinda Brasley and losing vision gaining insight, 2013. Unauthorized use and/or duplication of this material without express and written permission from this blog’s author and/or owner is strictly prohibited. Excerpts and links may be used, provided that full and clear credit is given to Belinda Brasley and Losing Vision Gaining Insight with appropriate and specific direction to the original content.